Everything that is in the pricier COIL bound, lay flat version is here. It is a less expensive way to get the information on how to make those ADD-ON Boeing fly in the MSFX simulation. A general survey of how to fly the Boeing jetliners that are equipped with the "glass" EFIS (Electronic Flight Instrument System). 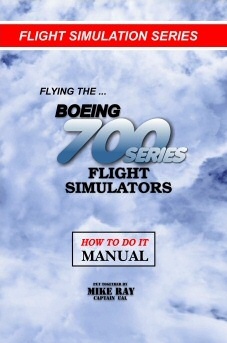 Captain Mike has included tutorials and tips as well as enough information to get those Boeing 737, 747,757. 767,777 jets up and running like they should. While information applies to the Microsoft Flight Simulator material specifically, it can also be applied to any flight sim program such as Prepar3d, X-Plane, ESP, etc. Good stuff.